Water and nutrition is essential for life, and although you can survive longer without food, you can’t survive very long without water, maybe only a few days. In addition, the body doesn’t have the ability to store water, so it must be ingested frequently. Water is a very simple molecule with a chemical formula that is very well known, which is H20, two elements of hydrogen and one element of oxygen. Water has a remarkable capacity to dissolve many different substances. In the body water contains dissolved minerals called electrolytes, which is essential for the life of cells that must have this electrolyte and water mixture in just the right balance to sustain cell life. Water and nutrition go hand in hand. The human body is mainly composed of water about 45-75% of body weight. People who are lean have more water in proportion to their weight, since muscle is almost three-fourths water by weight. Those who are heavier have less water since fat tissue is only about 10% water by weight. This is further evidence that water and nutrition are intertwined. 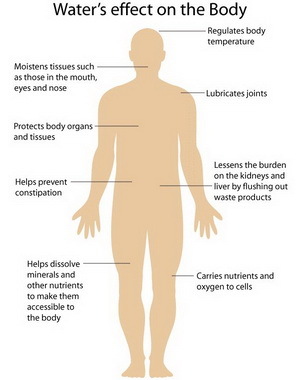 Water performs a number of different functions in the body. Water carries nutrients between the cells and organs, and removes wastes from cells and organs. From the intestinal tract water helps to render nutrients into a liquid form and moves these nutrients to the cells and tissues in this more usable form, and carries wastes from the body through the kidneys as urine. Water regulates body temperature, since it takes a long time to heat anything that contains water such as the body; therefore heat in the environment acting on the body has less of an effect on the body when there is enough water in the body to prevent adversely altering conditions in the cells of the body. Water also has the ability to cool, when body temperature begins to rise due to illness, environmental conditions or due to exercise. When the body becomes too warm then blood vessels in the body dilate and sweating begins, then as a result the sweat evaporates on the skin in the form of perspiration and cools the body. This is most effective in low humidity, but in the high humidity of the tropics, sweat may not evaporate as rapidly or as effectively to cool the body, since these are areas of high humidity. Water is needed for nearly all of the body’s chemical reactions of metabolism, since water is a solvent for vitamins, minerals, glucose, and amino acids. Water is necessary for maintaining the acid and base balance of the body called pH balance. Water is a major component of all of the body’s fluids, which serve major functions such as cleansing, lubrication, protection, and as shock absorbers. Some examples are the gentle cushion that amniotic fluid provides to protect the fetus in the mother’s womb, tears lubricate and cleanse the eyes, saliva moistens food making swallowing easier, synovial fluid makes it possible for joints to move more smoothly, and cerebral spinal fluid that protects the brain inside of the skull. There is no set intake that is sufficient for everyone. Each individual needs different amounts of water due to our body size, body composition, level of physical activity, and temperature and humidity in the environment. Some have recommended a certain number of glasses of water every day for everyone; this is a dangerous recommendation since too much water consumption for one’s particular body may be toxic doing more harm than good. So, the reality is that not everyone should have the same amount of water every day, there is no one size fits all water consumption level. Water should be ingested when the thirst mechanisms are triggered, and food is eaten at meals. Water and nutrition are important components of a healthy body. The recommended adequate intake (AI) for total water, including drinking water, other beverages and food consumed is 3.7 liters/day for men and 2.7 liters/day per women. For pregnant women the recommended AI increases to 3.0 liters/day and for lactating women the recommended AI is 3.8 liters/day. The emphasis is that water intake is a combination of drinking water, other beverages and water in food; this is what makes up the total water consumption. The proper amount of water and nutrition is needed to keep the body properly hydrated. An increase in water needs occurs with activity such as working out and sweating. Worldwide dehydration is a major killer, primarily due to gastrointestinal infections. These infections cause diarrhea, prolonged vomiting, which leads to excessive water loss. If left untreated and a person loses an amount of water equal to 20% of their body weight, then unconsciousness and death is likely to occur. Those that are particularly vulnerable are older adults and infants. For older adults the sense of thirst decreases as they age, and can lead to decreased fluid intake, and older adults often take diuretic medications often as a response to treatment for hypertension to eliminate excess fluid from the body. Infants can experience fluid loss through the skin and thus need to be kept hydrated, and this can generally be provided through the mother’s breast milk or infant formula. 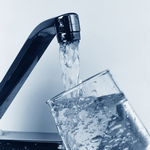 Signs of dehydration include fatigue, dry mouth, headache, and dark urine having a strong odor.